The beginning of the year is often a time when companies and teams plan their product development for the coming months. Project, product, and development managers gather to assess meetings, distribute resources, and commit to roadmaps. 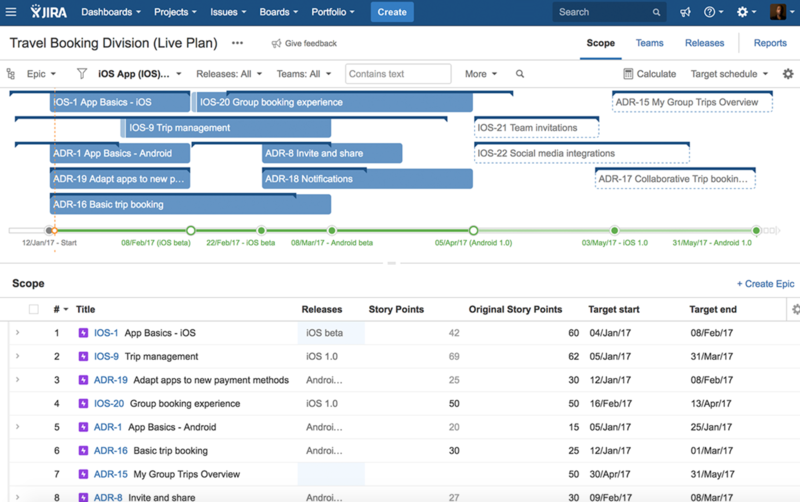 To facilitate this, Atlassian developed Portfolio for JIRA, which is now in version 2.2. The new release gives teams the ability to compare initial and current project timelines, select the best roadmap scenarios, and determine their velocity. Does your team have a deadline for delivering a product or project? Portfolio for JIRA 2.2 allows for start and end dates to be set so the team can always compare the actual delivery dates with the projected ones. Thus, there are two new columns for the start and end goals in the scope section, where the team can enter ideal delivery dates. These columns do not change when the actual work begins, but in the planning view they are displayed as blue bars. This gives you a constant reference point and clues as to where resources might be best redistributed, and an indication when other project start dates need to be rescheduled. Knowing the difference between target and current timelines also helps you to plan more realistic roadmaps using concrete data, plus you can use this to look back on and compare similar projects. You can also integrate long-term plans that don't have estimates, but are already on the calendar. 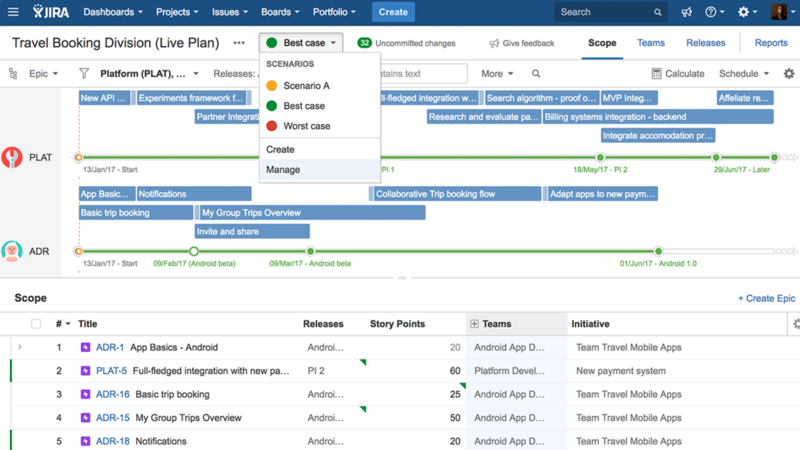 With Portfolio for JIRA 2.2, the velocity of a team for long-term plans can be quantified. The system offers a new column in the scope section of the plan for entering the initial details which can be referred to as "original story points" or "original estimates," depending on the assessment unit. This gives you an estimate of the scope of work required to deliver the projects. This column can serve as a frame of reference whenever the project is divided into more detailed story estimates. In this way, the accuracy of original estimates can always be matched with the actual values. Is the team far from their goal, or are they exceeding expectations? You can use this information to help balance workloads across teams and individuals. Matching original and actual estimates also gives teams a starting point for future long-term planning, which helps to ensure greater team velocity. With these new features, teams can look back and see how close their original ideas compare to their current ones. How accurate were our estimates? Did we underestimate or overstate story points? Did we deliver on time, or how far did we overshoot our targets? With such reflection, teams can learn from past experiences and tackle future plans with confidence and security. Are you interested in Portfolio for JIRA? Would you like to learn more and test JIRA with the Portfolio add-on free of charge and without obligations in a live system? Or do you want to license the product directly? We are one of the largest groups of Atlassian experts worldwide, with experience in hundreds of Atlassian projects. We're happy to help in all aspects concerning the introduction and optimization of your Atlassian tools: consulting and licensing, training, integration and customization, individual extension, hosting. Feel free to contact us!